Turkey has symbolically renamed a street where the United Arab Emirates' embassy is located in Ankara, following a diplomatic spat between the nations. 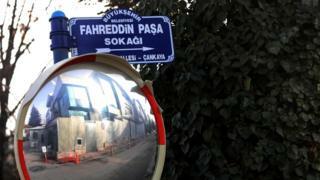 The street has been named Fahreddin Pasha Road, after an Ottoman military commander the UAE foreign minister appeared to criticise online. Abdullah bin Zayed al Nahyan shared a tweet that made allegations about Fahreddin and Turkish President Recep Tayyip Erdogan's ancestors. Mr Erdogan then hit back at the UAE. The original tweet suggested Fahreddin had mistreated Arabs while serving as governor of the holy Islamic city of Medina in the early 20th Century, and suggested his forces were related to Mr Erdogan. The Turkish president defended the former governor, questioning the UAE minister over his own ancestral heritage. Mr Erdogan told the minister to "know his place" and said the claims were "slanderous" before going on to accuse the UAE of being spoilt by "money and oil". A senior diplomat was recalled to Ankara to make a complaint about the post. Relations between the nations have been strained for months since Turkey sided with Qatar in a diplomatic dispute between the Gulf nations over alleged support for Islamic extremism. The mayor of Ankara confirmed the street name changes on his social media page. "As of now, the embassy's address will feature on official correspondence as Defender of Medina Street, Fahreddin Pasha Road. Good luck with it," Mustafa Tuna said in a tweet, in Turkish. In 1981, revolutionary Iran renamed the street where the British Embassy was located after IRA hunger striker Bobby Sands. Why is Turkey standing up for Qatar?